I am a marine biologist who has conducted biophysics-inspired research on a variety of Atlantic coastal organisms, from sperm whales to shrimp, to understand how these animals are uniquely adapted to their environments. My most recent work has explored how the ultrastructure of tissues influences their optical properties, and more specifically, how these optical properties relate to morphological and physiological mechanisms of camouflage in animals. I use an interdisciplinary approach by applying techniques in biophotonics to understand how certain organisms change color or render their bodies transparent. ​I’ve focused on investigating the physical basis of transparency in marine crustaceans: anemone shrimp (Family Palaemonidae) and hyperiid amphipods (Family Hyperiidae), that both include relatively large transparent species with significant musculature and complex body plans. My dissertation research in Sönke Johnsen’s lab at Duke University included a variety of microscopy techniques that I used to investigate the ultrastructure of these transparent crustaceans, from the cuticle surface to the interior muscle. Currently, as a postdoctoral researcher in Alon Gorodetsky’s lab at the University of California Irvine, I have expanded my research program by adding techniques from the fields of chemical engineering and materials science to broaden my study of camouflage to include dynamically tunable color-changing cells (e.g. iridophores and chromatophores) in cephalopods. I study how the ultrastructural arrangements of proteins in the cells is responsible for the formation of certain colors. Ultimately, my training has prepared me to lead a research program that uses integrative, comparative approaches to address questions in functional morphology at the intersection of biology and optics. My research will continue to explore the specific ultrastructures responsible for dynamic color-change or reversible transparency in marine animals. By using techniques from biology, chemistry, physics, and even nanoengineering, I will expand my study of transparency and other forms of dynamic camouflage to learn not only how various organisms have made their bodies transparent but also how we can use that information for various applications in nanomedicine and the physics of imaging systems. ​I examined the ultrastructure of the cuticle of hyperiid amphipods, the first surface to interact with light, to investigate whether any features minimized reflectance. I examined the cuticle surfaces of seven species of mostly transparent hyperiids using scanning electron microscopy and discovered two previously undocumented features that reduced reflectance. The legs of Cystisoma spp. were covered with an ordered array of nanoprotuberances that functioned optically as a graded refractive index material to reduce reflections (Left panel A). Additionally, I found that Cystisoma and six other species of hyperiids were covered with a monolayer of homogenous nanospheres (approximately 50 nm to 350 nm in diameter) that were most likely bacteria (Right panel B). I am currently working to identify these spheres. Optical modeling demonstrated that both the nanoprotuberances and the monolayers reduced reflectance by as much as 250-fold. These models of surface reflectance showed that the nanoprotuberances and spheres could improve crypsis in a featureless habitat where the smallest reflection could render an animal vulnerable to visual predation. I investigated how light scattering may be minimized internally using a morphological approach similar to my study of the cuticle surface. Using bright field microscopy, I explored whether there were any gross anatomical differences in the abdominal muscles between an opaque shrimp species, Lysmata wurdemanni (Panel A), and a similarly sized transparent species of shrimp, Ancylomenes pedersoni (Panel B). Although I saw no differences in muscle fiber size or any other gross anatomical features, I did see differences in muscle ultrastructure using transmission electron microscopy (TEM). I found that the myofibrils of the transparent species were twice the diameter of the opaque species. Over a given distance of muscle, light thus passes through fewer myofibrils due to their larger diameter, with fewer opportunities for light to be scattered at the interfaces between the high-index myofibrillar lattice and the surrounding lower-index fluid-filled sarcoplasmic reticulum. 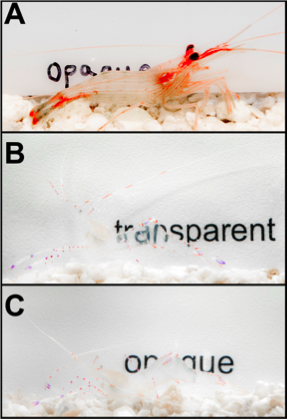 Also, because transparency is not always a static trait and can sometimes be disrupted after exercise or physiological stress (Panel C), I compared the ultrastructure of muscle in transparent A. pedersoni shrimp (Panel B) with the ultrastructure of muscle in A. pedersoni that had temporarily turned opaque after exercise (Panel C). I found that in this opacified tissue, the fluid-filled space around myofibrils had an increased thickness, which suggests that opacified tissue had some change in osmolarity or increase in fluid. Models of light scattering across a range of thicknesses and possible refractive indices showed that this observed increase in fluid-filled space dramatically reduced transparency. I further investigated how exertion or physiological stress disrupts transparency, what may occur in the tissues to cause this disruption, and what may explain the increased fluid-filled interface. I hypothesized that increased perfusion, or an increase in blood volume between muscle fibers, can disrupt the normal organization of tissue, resulting in increased light scattering. I measured pre- and post-exercise perfusion via the injection of a specific fluorescent stain that labeled the sarcolemmal areas in contact with hemolymph and the endothelial cells of the blood vessels, and found more open vessels and greater hemolymph perfusion around fibers post-exercise. Changing salinity in the shrimps’ aquaria, wounding the shrimp, and injecting proctolin (a vasodilator) were also associated with increased opacity and perfusion. 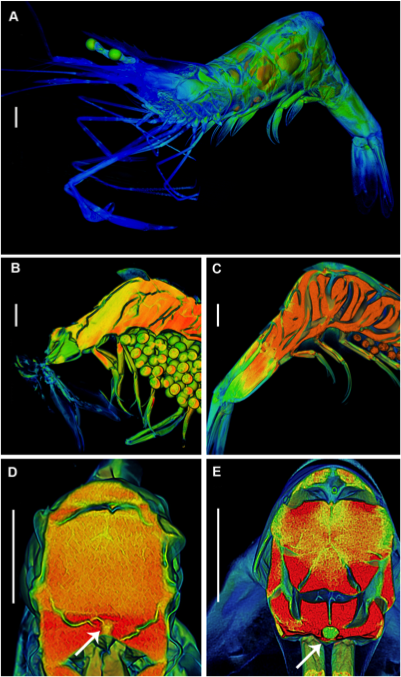 To visualize the shrimps’ overall muscle morphology, I used Diffusible Iodine-based Contrast-Enhanced Computed Tomography (DICECT) to scan control (transparent, Panels B and D) and experimental (opaque, Panels C and E) A. pedersoni. The resulting images added further support to my hypothesis that hemolymph volume in the muscle (shown as green-blue spaces in Panels B-E) increases in post-exercise opacified A. pedersoni. Transparency is one of the most common camouflage strategies for invertebrates and larval fish in the top 500 m of the ocean, with nearly all phyla having some transparent representatives, yet we are only at the early stages of knowledge about these animals’ physiology and ecology in their featureless habitat. My previous research into the physical basis of transparency in crustaceans only touches the surface of what there is to uncover about the diversity of animals that use this strategy, and the various ways they may achieve invisibility. My future research, therefore, will address these unanswered questions about mechanisms underlying transparent camouflage. Additionally, my postdoctoral training has expanded my focus to include color-changing animals with dynamically tunable structures. In support of these research goals, I recently collaborated with a multidisciplinary team of early career researchers on a UNOLS research cruise, where we made a foray into these animals’ midwater habitat using the HOV Alvin. The animals I observed, collected, and preserved from this dive will serve as important specimens for gathering more information about the refractive index, ultrastructure, and biochemical composition of transparent and color-changing tissues. Additionally, while existing collaborations with Woods Hole Oceanographic Institution, University of Rhode Island, Duke, and the Smithsonian will allow me to continue to research camouflage in midwater species, I also plan to perform research using coastal organisms that can be collected easily from docks, such as the ghost shrimp (Palaemonetes pugio), as well as transparent cnidarians and larval fish. In addition to the ultrastructural modifications for camouflage that I have already discovered, animals may make their bodies transparent using biochemical modifications. Clear organisms may solve the problem of light scattering by using high-index “clearing” agents to become transparent in the same way that a recently formulated urea-containing reagent called Scale has been used to clear mouse brains while still preserving the volume and structure of the tissue. Two hypotheses that I will be investigating in the near future include: (1) a clearing agent could raise the refractive index of the body fluids to approximate that of protein, thus minimizing internal light scattering and increasing transparency. Or, (2) another clearing strategy for matching refractive indices of internal components may be the insertion of specialized low-index lipids into cell membranes, which would lower scattering by causing the membrane to more closely match the index of the surrounding cytoplasm. This second biochemical hypothesis could be tested by drawing upon my previous expertise and research into the biophysics of whale blubber. Lipid molecules can be formed either endogenously or from dietary lipids; thus, diet (e.g. the ratio of omega-3 to omega-6 fatty acids) may be critically important in determining refractive index of the animal and thus may affect the maintenance of transparency. Identifying the lipids and their temperature-dependent phase characteristics that may affect overall refractive index will be important for understanding maintenance of transparency under changing environmental conditions. Future biochemical and ultrastructural analyses will be informed by the above characterization work. My research program is therefore poised to involve undergraduate researchers in using a variety of integrative and interdisciplinary techniques in the study of animal camouflage. These include: collecting plankton and other animals in local waters, performing animal husbandry in a wetlab, performing microscopy studies and learning more advanced techniques like electron microscopy and diffusible iodine-based contrast-enhanced computed tomography, and modeling the optical consequences of various observed structures.